#ipadband Wows Music Education Hub Conference! 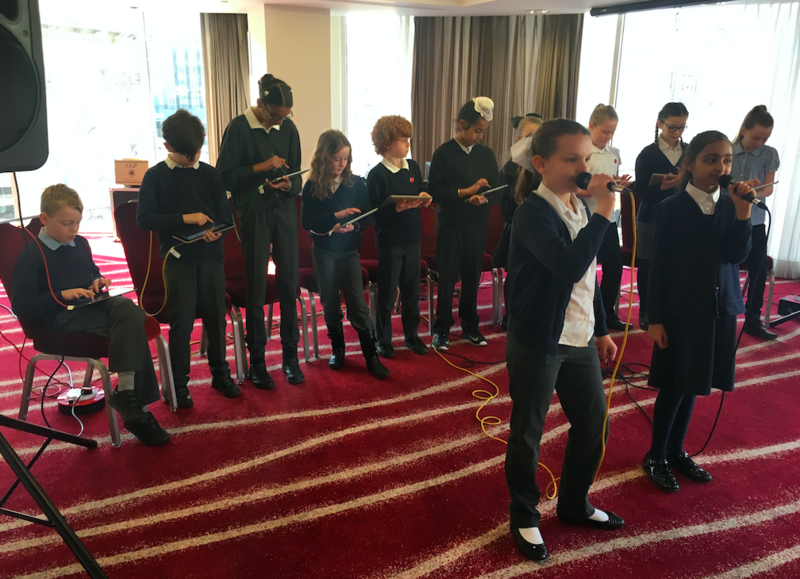 The #ipadband programme is renowned throughout schools and other organisations for its innovative way of engaging learners with music, but this time the #ipadband faced its toughest audience yet – a room full of music education specialists – and the learners from Pudsey Primrose Primary did not disappoint! Held in Leeds city centre on 28th February, the Music Education Hub Conference welcomed music education specialists from across the North of England. David Kirtlan worked with the children from Pudsey Primrose Hill Primary School to create an iPad band, and get them ready for the performance. Due to the school timetable, the rehearsals were done after school, and the children showed great enthusiasm in staying behind to take part in the rehearsals. With time growing short, David and the children worked hard to get to the standard expected from the #ipadband programme. On the day the children, though nervous, took to the stage like ducks to water, and under David’s careful conducting, quite simply rocked the entire conference! Many of the delegates had heard of an ipadband but had never seen one live. The response was amazing. Thanks for reading, and remember to sign up to our newsletter to keep up with the latest news from Elsium!